The catch was so stunning that for a moment even he himself stood there in disbelief. There is little denying the fact that the advent of T20s has raised the fielding level to a great level. With just 120 balls in an innings, even a single run is more than enough to change to course of the game. Consequently, the players try all they could to stop every possible run and sometimes their efforts lead to an eye-popping spectacle. 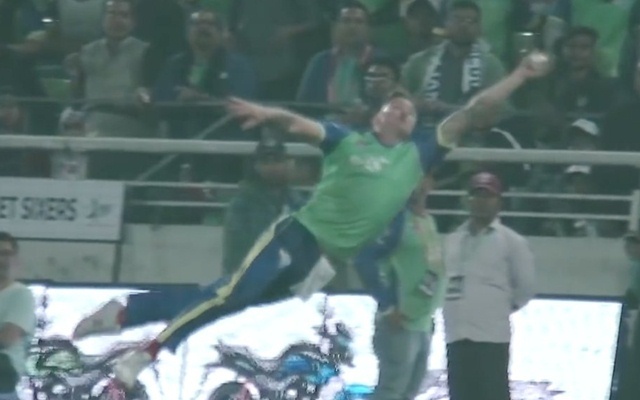 Well, England star Jason Roy did something similar during the game between Chittagong Vikings and Sylhet Sixers in the ongoing Bangladesh Premier League. The Sixers star pulled off undoubtedly one of the best catches ever seen on a cricket field. Not many would have thought that the ball would stop before crossing the boundary ropes before Roy did something that was scarcely believable. On the fourth ball of the eighth over of the Vikings’ innings, Yasir Ali had hit a fierce pull shot off Alok Kapali. The ball was travelling like a rocket and was primed to cross the ropes. However, Roy kept his eye on the ball and timed his dive to perfection to take the catch just near the fence with a dive. The catch was so stunning that for a moment even he himself stood there in disbelief. The Sixers beat Vikings comfortably by 29 runs. Asked to bat first, the Sixers, without their injured skipper David Warner, scored 165 for 5. Windies star Andre Fletcher laid the foundation for the challenging total by scoring 66 at the top of the order. Mohammad Nawaz (34 off 19) and Sabbir Rahman (32) then played handy knocks to ensure the Sixers finish above 150. In reply, the Vikings rarely looked in contention to chase down the total. Skipper Mushfiqur Rahim once again waged a lone battle, scoring 48 but little support from other end meant the Vikings were all out for just 136.